It All Starts With "Ous"
Two of the foundations of martial arts training are ‘etiquette’ and ‘respect’. The lessons we learn in the dojo…both physical and emotional…come from a long line of masters. By being respectful both inside and outside the dojo, it is a tribute to our teachers. Respect includes being polite and mindful of other people’s space. But besides these two foundations, there are other valuable foundations of a Sensei / student relationship, such as loyalty and trust. Ous is way of responding to Sensei’s direction. It is way of showing respect. At Northstar Ju Jitsu, we certainly use ous in that way. As can be seen above, ous is a very versatile, all-encompassing word. When I ous, I do so as “I acknowledge” and “I understand”. Sensei and the instructors are taking the time to help me as a martial artist and a person, so I acknowledge that I have heard what is being explained. If anybody helps you in the dojo or life, it is polite to let the other person know that you have understood them. Furthermore, ous is Sensei’s preferred method of responding. It is part of the dojo etiquette. It would be disrespectful not to acknowledge Sensei in his preferred manner, especially if he is assisting me. By ous-ing, it is also showing that I am attending. The mind does not always work to our benefit. The mind is often easily distracted. By ous-ing, it is bringing you back to the “here and now”. It is helping you focus completely on what your instructor is telling / showing you. It does not help to live life in the past or the future. Real living is done in the present moment. Ous helps with this. This not only applies in the dojo, but also in real life. Now, as mentioned above, ous does not always mean “yes”. Sensei and your instructors may say some truths which I may not initially like, but they need to be said. Your ability as a martial artist will be how well you remain neutral under pressure and to respond clearly to what is needed. Therefore, if your ability is being measured by your response, the first step must be ous – I acknowledge what has been said. Remember, every situation that presents itself is neutral. It is your ego and / or emotions that then paint that situation as good or bad. Ous helps you acknowledge the situation. Ous helps you remain still, neutral and in control. Once you acknowledge a situation for what it is, it then helps you deal appropriately with the needs of the matter. But it all starts with ous. 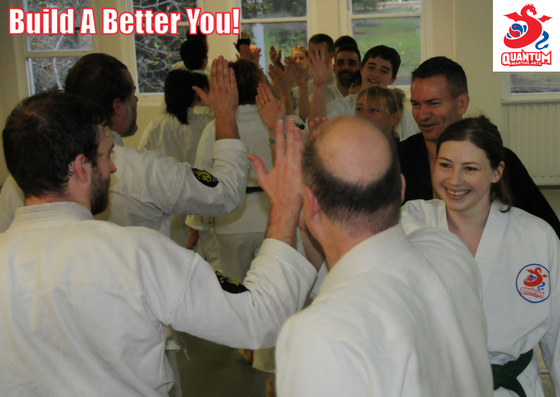 Joining a martial arts dojo is different to joining a gym. In martial arts, you have instructors who want to help you physically, mentally and emotionally. However, it can take years to gain the trust of Sensei and the senior instructors. The relationship between Sensei and student grows as the student proves their commitment. Ous is a way of showing your commitment. By acknowledging Sensei and letting him know that he is understood, it is helping build that trust. Once the trust has developed, that is where the student’s real learning begins. But again, it all starts with ous. In saying the above, you do not just want to be respectful and show etiquette in the dojo. You want to apply this to your daily life. Who doesn’t want to be a better person….to “build a better you?” The ability to look and acknowledge any situation has to be practised in all daily activities. If you can simply acknowledge a situation…acknowledge somebody speaking to you….acknowledge your own thoughts on things….it helps you see the choices. Hopefully, you will choose the option of peace. But before you can get to this point, you must start by acknowledging and understanding. It all comes back to the ous. As an instructor myself, ous helps me when teaching class. I know that the instructions are being heard. This helps me bring further energy to the class dynamic, as I love helping out. In life, whatever you put out there will come back to you. If you are respectful, polite and acknowledge other people when they help you, you will also be treated with respect. You will gain trust and loyalty from those around you. But it all starts with “ous”.